Kasich and Brown said they are weighing options, with nothing to announce yet. As the race to challenge President Donald Trump in the 2020 general election kicks off, two Ohioans addressed speculation that they would mount runs for the White House in 2020. On "This Week" Sunday, outgoing Republican Gov. John Kasich and recently re-elected Democratic Sen. Sherrod Brown said they are considering their options, but that they have no plans to announce as of yet. "Very seriously. I’m considering it," Kasich told ABC News Chief Anchor George Stephanopoulos when asked how serious he was about a 2020 run against President Trump. “These are earnest conversations that go on virtually every day with some of my friends, with my family,” Kasich added, noting that he doesn't know when he will have to make a final decision. Kasich, 66, unsuccessfully ran for president twice before in 2000 and 2016. 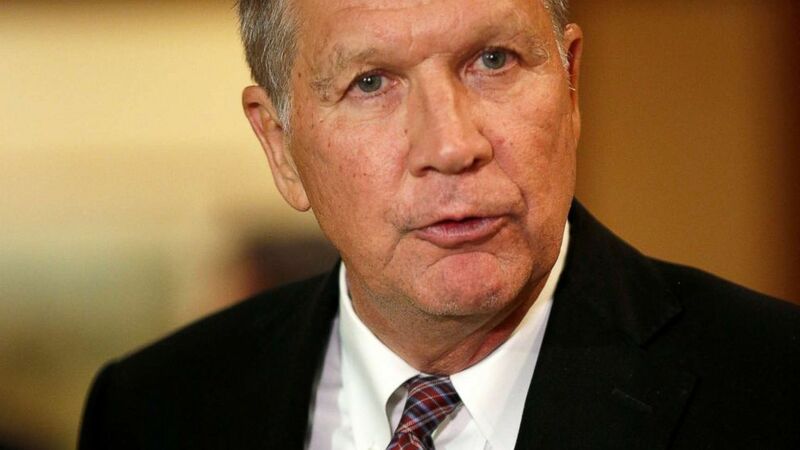 He is term-limited as governor of Ohio and has been an outspoken critic of the Trump administration. Asked whether a challenge to Trump from within the Republican Party could gain support, Kasich said “all options are on the table for me,” including not ruling out a third-party run. “Let’s just say that Donald Trump is nominated and Elizabeth Warren is nominated, and you have this ocean of people who sit in the middle. Is there a legitimate opportunity for a third party, bipartisan kind of ticket to be able to – to score a victory or to have a profound impact on the future of American politics?” Kasich asked. (Elizabeth Frantz/Reuters) Ohio Governor and former presidential candidate John Kasich speaks to the press in Concord, N.H., Nov. 15, 2018. Brown, like Kasich, said on “This Week” he is now "seriously thinking" about his own 2020 presidential run. “I haven’t made trips to Iowa or New Hampshire, I haven’t done any of those things to prepare," he said. "But we're seriously thinking about it. We're seriously talking about it with family and friends and political allies who have come to me about this." Brown, also 66, won re-election to the U.S. Senate earlier this month despite a trend favoring Republicans statewide in Ohio. While Brown handily won re-election, Democrats did not fare as well in the state’s gubernatorial election, with Republican Mike DeWine winning by 4 percent over Democrat Richard Cordray. Brown said that he wants his message, and the message of Democrats everywhere, to be about the "dignity of work," which includes honoring and respecting "all workers whether they punch a clock or swipe a badge, whether they're raising kids, whether they're working on salary, working for tips." (John Minchillo/AP) Sen. Sherrod Brown, D-Ohio, right, speaks alongside his wife Connie Schultz, left, during the Ohio Democratic Party election night watch party, Nov. 6, 2018, in Columbus, Ohio. And when asked whether he would favor another Democrat over a campaign of his own, he said the decision is more personal to him than that. "I respect a number of my colleagues," Brown said. "I don't see this as me against any individual person." In a crowded field of potential candidates, Brown and Kasich each said that the United States is in need of new leadership. Kasich said he's concerned about the president's tone and rhetoric, but also with the policies that have been implemented over the past two years, specifically pointing to rising debt and inaction on immigration. The question he said he is facing now is, "what do I do about this?" Brown also addressed the rise of populism in American politics and said that at its core it is about helping everyone, not blaming others for problems. "To me, populism is never anti-Semitic, it's never racist, it never pushes people down in order to lift others up, that's the phony populism of Donald Trump," Brown said. "To me, populism respects the dignity of work and moves forward and tries to lift all boats." Kasich honed in on Republicans' success in his state, calling 2018 a "a heck of a year for Republicans in Ohio." He cited a "roadmap" that included cutting taxes and expanding Medicaid as the path to success, and added that "I think it's a roadmap not just for Republicans but for Democrats as well." 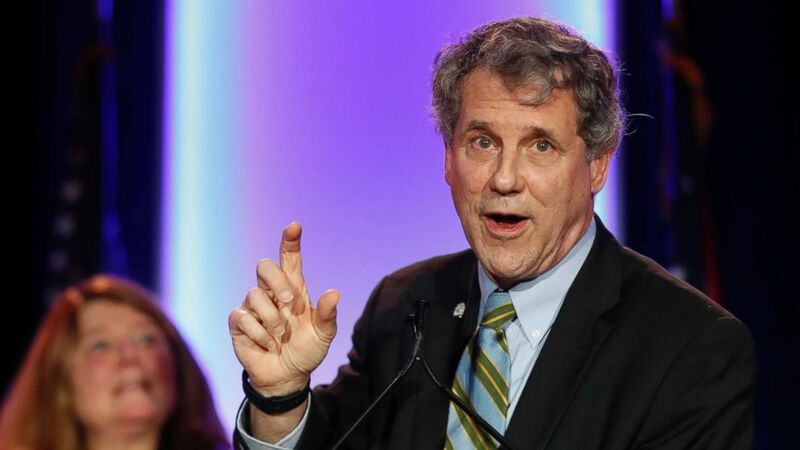 Brown said that he has never had a dream of being president and that regardless of what he decides about 2020, he wants to continue to focus on his message of improving life for workers. (Chip Somodevilla/Getty Images) The Rev. 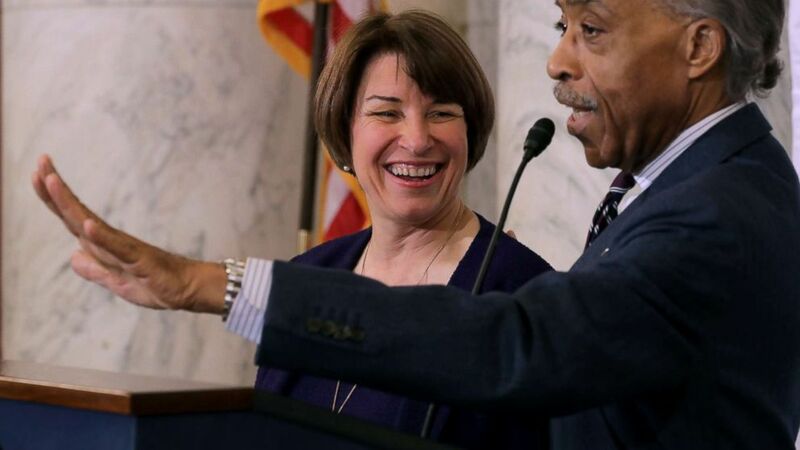 Al Sharpton welcomes Sen. Amy Klobuchar (D-MN) to the podium before she addresses a post-midterm election meeting of Sharpton's National Action Network on Capitol Hill, Nov. 13, 2018. Outside of the Buckeye State, other Midwesterners are also contemplating runs for the White House, including Sen. Amy Klobuchar, D-Minnesota. "Well, people are talking to me about this, I think, in part because I’ve worked really hard to go not just where it's comfortable but where it's uncomfortable," Klobuchar said on "This Week" Sunday. She added that she "did well in a number of those places that Donald Trump won." The Iowa caucuses, which will be the first primary races of the 2020 cycle, are scheduled for February 2020. "But right now, I am just still thinking about this, talking to people," Klobuchar told Stephanopoulos. "I'm sorry to say, I have no announcement for you on your show."